It was a moment to savor for the founders of AsianInNY whose vision ten years ago came to full fruition on an afternoon where all the elements came together for a fitting celebration of an era. Diana and Christopher, founders of AsianInNY knew what they were trying to accomplish a decade ago and they forged a legacy day in and day out as the quintessential Asian networking and multicultural sharing site. Networking at the highest levels is what the AsianInNY has grown over the years and this event was no exception. Audrey Tang, Digital Minister of Taiwan Executive Yuan, Lang-Lang Chief Executive Officer, Leszek Lukas Barwinski-Brown, Carol k. Walker, the Dean of the School of the Arts as well as Dean of Dance at Purchase College all attended its 10th Anniversary Fashion Show. Also in attendance was Anthony Salcito, VP of Worldwide Education at Microsoft and Charles Sullivan, Chairman of the National Football League Management Council and Premier Event Management owner along with Afu Ho, band leader Sodagreen, the popular band from Taiwan. At the TF Chen Art Building in midtown Manhattan, history was made as AsianinNY became the first group to present a fashion show there. The founder of this building, Dr. T.F. Chen, a man of diverse interests would appreciate the diversity on display that afternoon. Six Asian fashion designers, each imprinting this event through their respective creative eyes would shape what we saw clothing wise but song and dance took center stage setting the tone of the event from the start as well as providing seamless connection points between designers making this the smoothest and quickest of shows as well. Starting things off would be Naima Mora, cycle four winner of America’s Next Top Model. But not as well- known perhaps was her vocal talents for the band Chewing Pics and Galaxy of Tar. We got to see that aspect of her talent as she brought star power to open the fashion show. At the center of the show, we were exposed to dancer-choreographer Pei Ju Chien-Pott who whirled and spun a story with each step, light yet powerful in expression even neatly setting up one of the fashion segments featuring the work of Jessica Chen, who in viewing Pei’s dance performance “Rebirth” previously found much inspiration from it and the focus on loose yet form fitting outfits that resemble a dancers type with much freedom in movement guaranteed by Chen’s designs. For impact you had to speak of Wow Taiwan, whose display of dance, vocal, magic sets and video in a stew of sumptuous seconds and thirds filled the audience with more than they bargained for. It was very much like anime on stage with sound effects, group team dances to thumping beats in perfect unison and even a WarGod decked out resembling the Transformer Optimus Prime. The theme of many of the performances this afternoon was an ode to nature and the butterfly image perfectly displayed to appear to be coming from artists was a neat effect that fully enhanced the performance. And we can’t forget Pamela J. Powell, the R&B belting Filipina, who returned to bring her sultry vocals to play bringing a change in style which was slower in tempo bringing a necessary cooling down period to what had been a rapid succession of designer sets. But Fashion was the core of this event and six of Taiwan’s finest designers brought their distinctive tastes to bear starting with. Joe Chan fashions spoke of urban future shock which was the best way to describe Joe Chan and his presentations. These looks are comfortable to wear and one can envision the youth of the future walking on the streets with many of these variations. Pai Cheng Cheng pieces are unique in that they are loud and colorful seemingly pulling from a bin of high quality items and fused together to create a culture all its own. Pai has no limit to what he can do with colors and cloth. Andre Kao, the indigenous designer from Taiwan impressed the audience with his strong sense of originality of work. His collection has perfectly brought out the human figure and thus expressing his dimensional designs through crossover materials. Alexandra Peng Charton showed that designing eyewear has a place in fashion. Her company TC CHARTON, which specializes in luxury glasses for Asian consumers. This show her wares were shown as versatile working well with various styles and people. It hinted to a throwback to the 70’s styles came together in a fusion of classic ensembles. Chelsea Liu and her wedding dresses was arguably the most eye-opening display of cloth. The show transformed into a wedding theme and all were engrossed in the variety of styles pulled from a timeless and traditional dress. The exposure of Chelsea’s wares here drew the interest of various houses in which she was able to launch her gowns in Designer Loft, Shopshops, Bridal Reflections and Wedding Atelier confirming the value of networking and continues to affirm what the AsianInNY been trying to establish and ten years later, its affirmed. 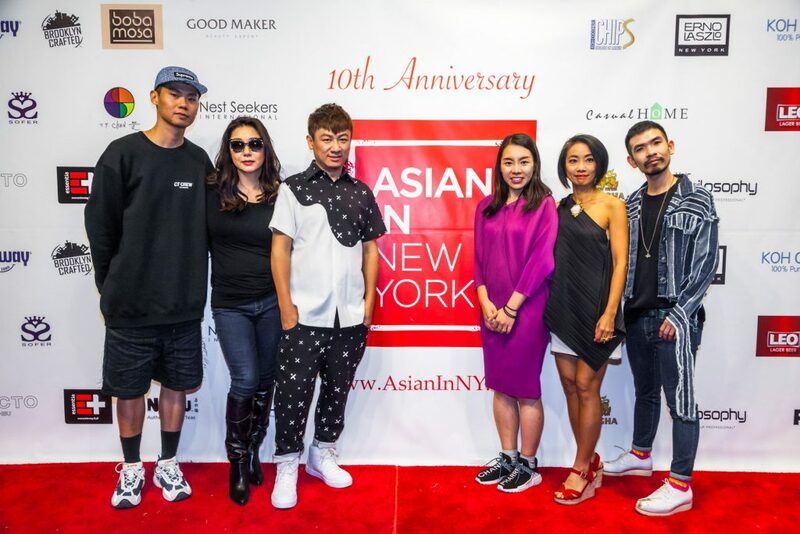 AsianInNY’s 10th Annual Fashion Show is co-hosted by the Ministry of Culture of Taiwan. The cocktail reception is presented by Brooklyn Crafted Ginger Beer, BobaMosa, Essentia Water, NOYU Teas, Kefir, KOH Coconut, KOH Chips, VIVALOE, Leo Beer and Singha Beer. Other sponsors include Erno Laszlo, Good Maker Beauty Expert, EVA Airways, SOFER, Casual Home, Aegis Service, Mei Li, TCCNY, Nestseekers, Little Flower NYC, and The Grand at Sky View Parc. Additional support is provided by Hair Philosophy, Cakra Fashion Makeup & Skincare, YUAN’S JEWELRY and FACTO.